So on the same day PH features one of the most exciting driver's cars ever produced, Google reveals its first driverless car. Oh Lordy. Having adapted conventional cars for its previous driverless projects, Google has now designed a car from the ground up. As you can see, it has been styled to appear as inoffensive and 'nice' as possible, with a face that looks like something from a Nintendo game made from squishy foam. Aww. Google's head of the self driving project is Chris Urmson who said the car is "something that will allow us to really push the capabilities of self driving technology, and understand the limitations". 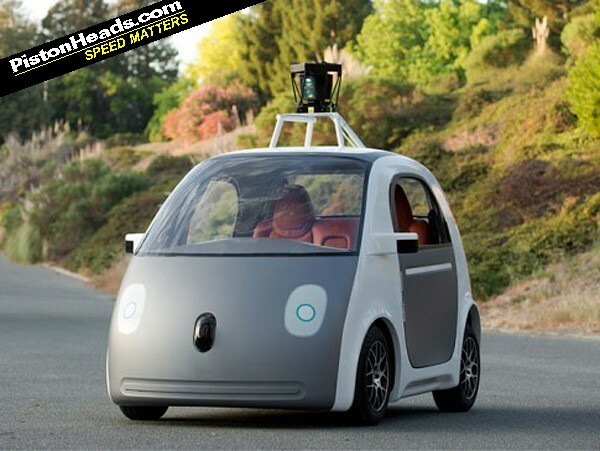 He expects the 100 test cars to be on the roads around Google's Silicon Valley base within a year. Vid here crammed with Google sickly sweetness and old people. Dudes, make the wheels fit the arches, is it so difficult? Wonder when city traffic last ran at 25mph. Wont this just gridlock at high traffic flows, i.e. set distance? Good luck to them, I think autonomous cars have a lot of uses. I live in pensioner central and some of the driving round here is pretty special, if they could instead have one of these it would make everything work better. There are times (usually at 4am or in traffic) when I wish my car could drive itself and I could sit back and have a bit of a snooze, read the paper or watch some tv. Also taxis that weren't driven by maniacs would be a great improvement.